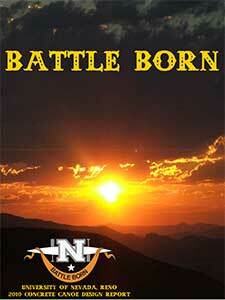 Our team's history didn't begin in 2006, rather this is when we began placing as a national contender. We were constructing canoes in the 1970s, 1980s, and 1990s. 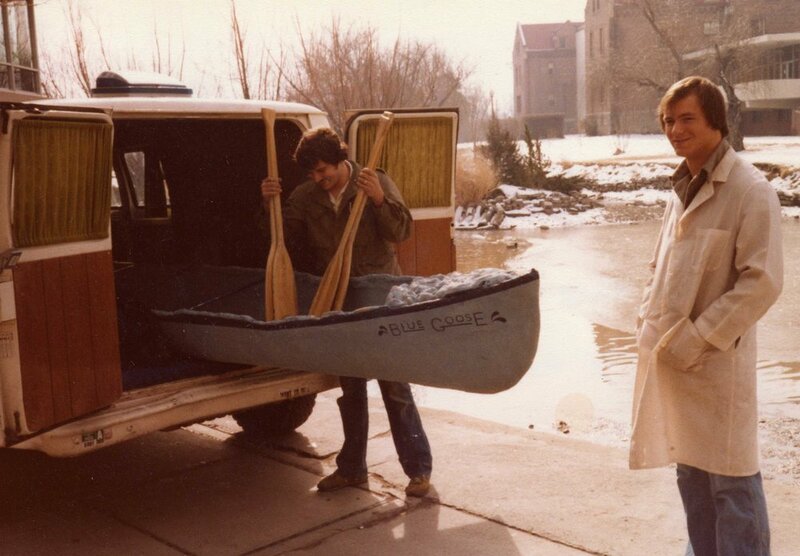 The oldest one we could locate is of a canoe called “Blue Goose” being transported across campus to Manzanita Lake in an old van. There are others we found as well, most notably “The Expedition,” “Pink Lady,” and the short little canoe shows how far our team has come. 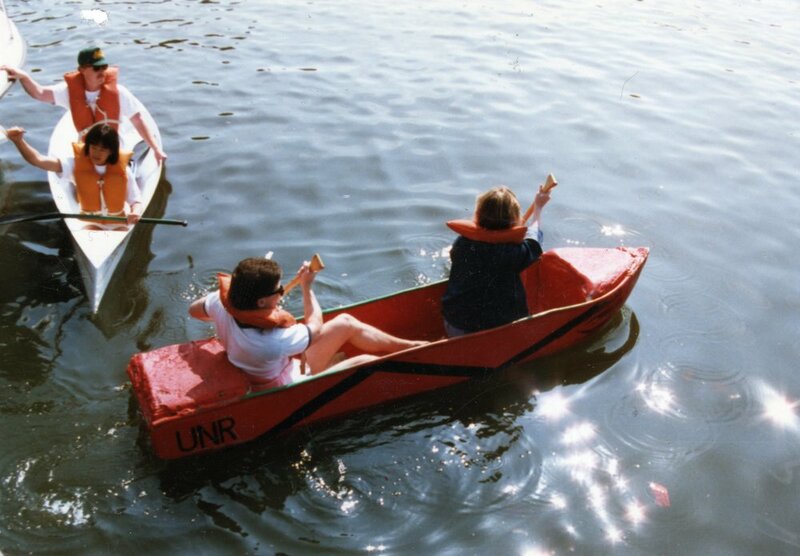 Between the mid-1990s and 2004, there was no concrete canoe team on campus. 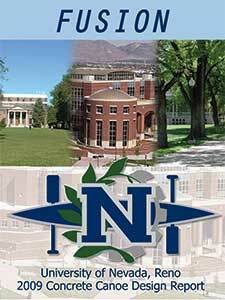 This changed in 2005 when members of the UNR ASCE Student chapter recreated the team. The only reference the new team had were the photos below and their passion to do their best, Overall the team placed 5th in the regional conference which was a huge success for a team that hadn't existed for roughly a decade. From there the team had a reference point and continued to push the limits. New designs and testing methods were engineered through trial and error. Every year new rules and regulations are made to the canoe specifications by ASCE for the competition. These changes provide a challenge that allow us to engineer a better canoe. From our roots to the present day, our team has accepted and successfully accomplished the challenge every year. The 2018 team returned to the 2016 theme of focusing more on nature and show Nevada's beauty. The team's performance by getting first in all races and bringing an overall high quality project demonstrates the team's success with new methodologies and techniques. The 2017 team took on a new design challenge by integrating their theme with Reno's local Burning Man event. Additionally, the team returned to a familiar canoe length and weight that worked well in construction and paddling. The team acquired first in all races and demonstrated its ingenuity by working with local leaders within the Reno community. The 2016 team went through new design changes which included a narrower boat, compared to previous years, as well as using stained concrete instead of stenciled designs. Regardless of the designs, the team landed an impressive 1st place in regionals and 3rd at nationals. Additionally, the team hosted the 2016 Mid-Pacific conference with an amazing success! "Our consistent top finishes exemplify the quality and determination of the students in our civil engineering program. Year after year, the students dedicate a huge amount of time outside their studies on this competition, and it shows in their continued successes." "Our paddling team dominated in the men's and women's endurance races and the men's and women's sprints. We did great competing among the likes of Berkeley, Sacramento State and Tongji University and we want to thank everyone for their support of the University's ASCE chapter." "I am very proud of this team and its consistent accomplishments. They exemplify dedication, national competitiveness, consistency and achievement." "There are three factors behind the success of the competition and the performance of our team: the students who rise up and the do the work, alumni who provide support and technical expertise and our sponsors. Without all three, this top-five finish and successful event would not have been possible." "Our lightweight concrete made a huge difference from last year. Weight is such an important factor. Our canoe, Black Diamond, was 45 to 50 pounds lighter than last years at about 175 pounds, and considerably lighter than Fresno State's which weighed in at 750 pounds." "At our first meeting in August, with a young team and new design challenges, we had to decide if this year would be for fun and learning or to be competitive. We set our goal to be in the top three at nationals so I'm thrilled with our finish. The team did great." "We spent many all-nighters working on the canoe and countless hours doing analysis. The project consumes most of our free time but it is all worth it after seeing all the awards we get. The past few months we made great friendships, found out that we have a team we can depend on, and most importantly, that we had a lot of fun working on one of the most intense projects of our college career." "Our students were absolutely fantastic, and their sportsmanship as great ambassadors for the University was unbelievable. They (scored) high in all categories and this is a huge win, not just for the College of Engineering, but for the entire University." The 2007 team finished an impressive third place in its second national appearance. A lighter, shorter and stronger canoe helped the team to first and second place finishes in final product and design paper, respectively. The 2006 team made the University's first appearance at the national level. The team built on the work of the 2005 team, who had started anew after a seven-year absence, resulting in improved aesthetics and new tools and techniques added to the team's arsenal. The team's sixth place finish out of 23 total teams was an impressive national debut, setting the stage for great things to come.